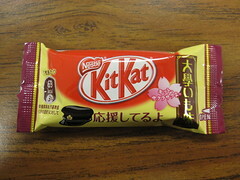 Nestle has been recycling KitKat flavors in Japan again, but in this case, it worked out to my advantage. I didn't get to try the candied sweet potato (daigaku imo in Japanese) KitKat the first time around. I've never had daigaku imo before, but the idea reminds me of the canned candied yams often served in American Thanksgiving dinners - even though I know that's way off (no soy sauce in candied yams, for instance). I looked at this recipe to get an idea of how daigaku imo would taste, but I'll have to try making it soon. This white chocolate-based KitKat had an odd, buttery smell that reminded me of the Roasted Corn KitKat from 2 years ago. Thankfully, this buttery scent didn't carry over into the flavor. The white chocolate tasted almost lemony with maybe just a hint of sweet potato. 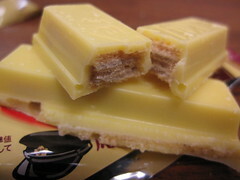 It was very sweet, as white chocolate KitKats often are, but the flavor was pretty good. I couldn't really pin the flavor down, and I would never have guessed that it was supposed to be candied sweet potato. Maybe that's because I've never had the real thing, but all I tasted was a mildly lemony white chocolate KitKat. That Kit-Kat looks tasty! I would love to try it! Where do you buy those Kit-Kats? I have been dying to try a Purple Potato Kit-Kat but I can't find any place to buy any Kit-Kats like that in boxes!